Dad's Day or Sad Day? Dad’s Day or Sad Day? Father’s Day doesn’t even come close to Mother’s Day on telephone calls, greater even than Christmas. But Father’s Day has the most collect calls! The real first Father’s Day was 7,000 years ago when Adam and Eve’s two boys, Cain and Abel, brought an offering to their heavenly Father. Father’s Day, contrary to what many believe, was not established as a holiday to help greeting card companies, because when an annual “Father’s Day” was first proposed there were none. America’s first Father’s Day was observed in Spokane, Washington, in 1910. Louise Smart Dodd first proposed the idea of a “Father’s Day” in 1909. Mrs. Dodd wanted a special day to honor her father, William Smart, a Civil War veteran, who was widowed when his wife died in childbirth with their sixth child. Mr. Smart was left to raise the newborn and his other five children all by himself. Mrs. Dodd wanted Father’s Day to be celebrated on her father’s birthday. Over the next decade, cities across America began celebrating a day for fathers. In 1924 President Coolidge supported the idea of a national Father’s Day. In 1966 President Johnson signed a presidential proclamation declaring the third Sunday of June as Father’s Day. In 1972 President Nixon established a permanent national observance of Father’s Day. This came 60 years after Mother’s Day was proclaimed a national day of observance. Ladies first! Some traditions: If your father is living, wear a red rose; If your father has passed away, wear a white rose; Give a very creative tie to your father; Have a cookout, prepared by your Dad, himself, if possible; Tell your Dad how much you love him—and why; Give him a big hug! During 50 years in Japan we’ve watched the commercialization of national holidays. Bakeries put Christmas on the map with their Decoration Cakes! Chocolate companies promote Valentine’s Day. They still haven’t come up with Easter ideas. Father’s Day means buying a tie for dear old Dad. Children once gathered up their millionaire father’s belongings to ship them away. In his lock box were faded Father’s Day cards carefully tucked in among the stocks and bonds. What about Japan’s fathers? A clinical, statistical, dry report in the April Japan Close-up magazine features “How Japan’s Dads Rate.” The magazine is put out by PHP (Peace, Health and Prosperity) founded by the owner of Matsushita Denki (National). He once saw water running from a spigot in a field and wondered why electricity couldn’t be as freely used as water. The rest is history. The article states, “The father’s role is coming under increased scrutiny as the number of violent incidents by children increases. Many believe that the issues troubling our youngsters stem from the collapse of the family unit or the ‘absent father.’ Today’s fathers between 20 and 40 may represent the first generation in history expected to take on equal responsibility for child rearing. “Without role models, their every-day struggle to discover what makes a good father is a matter of trial and error. 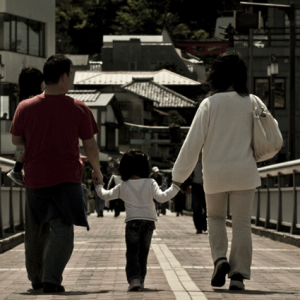 For Japan fathers, it produced what the latest Newsweek cover story (June 30, ’01) called: the “Freeters,” a combination of “free” and “arbeit” or free workers. Independent drifters from one job to the other. These were raised in the 10 years of Japan’s lost boom years. They saw their fathers working dawn to dusk and having nothing to show for it and they don’t want to repeat that. It features a young man with a law degree who would rather work for himself by passing out fliers than in a law firm. Is this the future of Japan? Now we look to Christians. My dear old father fled Northern Persia to escape a massacre in 1917 by the major religious party, which slaughtered 180,000 Christians. This pales in comparison to the 1,500,000 Armeni­ans killed. Dad arrived in Chicago via Russia, London and ship, with $8 in his pocket. He had to work at two or three jobs in real estate and hotels while learning English. His four children all finished college and three went into professions. He got home at midnight and was snoring when we left for school. Absent father! A father like that gets a zero chance of producing any children of value. But God…Jesus….made the difference….and his wife was a praying Christian. One of my early Japanese pastor friends reared six children in very austere circumstances after the war. Everything was scarce, yet five out of the six entered the Christian ministry in Japan and America. One pastors the biggest church in Kanto, with more than 1,000 seats. The difference was God and His Son Jesus.